We teach our campers that not every child has the opportunity to experience camp. But, it is our belief, that every child should have that chance. So, every Tuesday, our campers participate in our Camp Champions Day, where we raise money to send underprivileged children to camp throughout New England. Our hope is that our campers, throughout their experience at Matoaka, will look back at their time at One Great Place as one of the highlights of their life, not just their childhood. And, that the values we pursue each and every day are still the same values that keep campers returning to Matoaka summer after summer! History is very important to Matoaka. We invite our alumnae to camp every Friday to share their stories of what camp was like when they attended, and how the values that were instilled in them as a camper, are values they still hold dear today. Our campers love hearing stories about how gymnastics used to be taught on the front lawn, and how archery was held next to the bunkline! 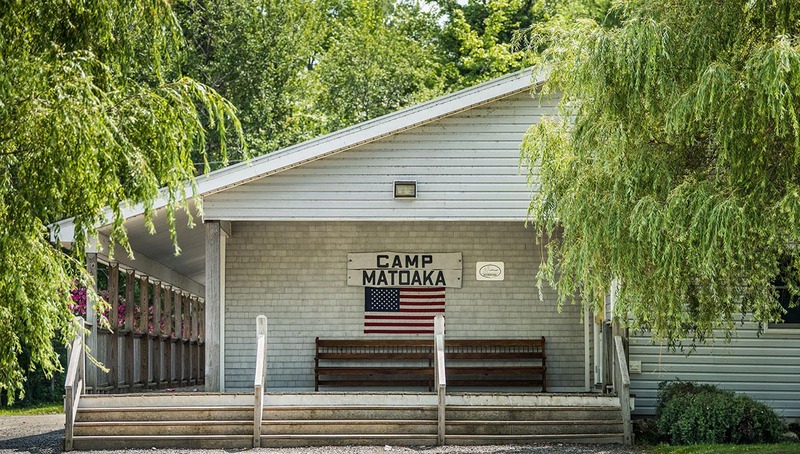 Every Tuesday at Matoaka is Camp Champions Day, where our campers earn points at activities to help raise money to send underprivileged children to camp throughout New England. At the end of the summer, a pledge card is mailed home with the points your daughter earns, and we ask our parents to donate 10 cents a point, or $1 a point, or any amount to help send more children to camp who would never have the opportunity. Camp Matoaka matches the dollar amount that our families contribute, and we are proud to be a Home Run Sponsor every year to support Camp Champions, an incredibly worthy organization. We partner with World of Change, a Maine-based nonprofit that converts spare change into social change for children and families. Our campers, staff, families, and visitors can select from six barrels to donate loose change for the cause of their choice. Our campers and staff love stopping by the office with their loose change from a trip to choose which area they want to help! Our older campers volunteer at Pine Tree Camp, a camp for disabled children and adults, as well, as Camp Sunshine, a camp for families affected by life-threatening childhood illnesses. At the end of the summer, we also partner with Camp To Belong, a camp that reunites brothers and sisters who have become separated in foster care through a week of camp. Camp Matoaka is proud to partner with Camp To Belong, and to have so many people within the Matoaka Community volunteer their time to help run a powerful one-week program. At camp, each age group focuses on different principles, all of which are prominently displayed on the Principle Pole when you come into camp. 8- and 9-year-old campers focus on “independence” and “courage” since for many of them it is their first summer away from home. Our 10-year-olds focus on “confidence” and “honesty” since they are starting to become more comfortable being away from home, and learning to advocate for themselves. Our 11-year-olds work on “cooperation” and “resilience,” since they are learning to live with campers with whom they may have differences, and they develop a toughness and resolve. Our 12-year-olds concentrate on “loyalty” and “gratitude,” as many of them have been at camp for a few years, and develop a deeper appreciation for Matoaka Magic. Our 13-year-olds concentrate on “respect” and “integrity,” because they are now Seniors at camp, and are living the true values of Matoaka. Our 14-year-olds focus on “compassion” and “leadership” as they are emerging as our leaders, and will be looked up to by hundreds of girls who aspire to be in their shoes. Our oldest age group, our 15-year-olds focus on “community.” When you walk into the Bunk 15 Cabin, you see three very large letters “T B Y,” which means “Think Beyond Yourself.” Our oldest campers focus on giving back to Matoaka and making sure that they pass on all the traditions, songs and, most importantly, the spirit that has defined them over their years at Matoaka.